← Anderson Pens Video Podcast Episode 160 – With Special Guest Cary Yeager from Fountain Pen Day! Yesterday afternoon a moment we have waited for a long time finally came to be. After several years at my present day job I gave notice of resignation. I was asked all the usual questions of my boss. Is there a problem with one of your co-workers? Is there a problem with me? Is it a problem with the new merger? Did you have a better offer? My answers were simply, No, No, No, and Yes. You see, Anderson Pens just down the street had an opening for Pen Repair Guy, and I was qualified and took the job. In a little over two weeks, I’ll make AP my new home full time. This past weekend we moved the repair shop from the house to the store, along with over 1000 pens (or is it 2000? not really sure, but it is a LOT) in need of restoration, including hundreds and hundreds of Esterbrooks. So, I’m sure some of you are asking the question, Why “Ripping off the Band-Aid”? Well, my boss works two hours away from my office, and I felt it important to tell him in person. That’s just the type of guy I am. When I discovered he was in the office yesterday, several days sooner than I anticipated making my resignation, I decided it was time to tell him. Like others would be, I was nervous. I texted with good friends, texted Lisa, and in Lisa’s wonderful wisdom she told me, “Rip off that band aid of oppression!” I smiled and laughed then walked down the hall and took the leap. So here we are. Two weeks to go, and then I will be blessed to work full time in the store we created. No longer do I have to hope people come in after 4:00 pm so I can see them. Soon I will be able to trim down the repair queue from 12 weeks to something more manageable. Pen show preparation will be easier, and the travel home from shows will be significantly easier as we will no longer need to rush back so I can get to work. And all those thousands of beautiful pens we’ve been hoarding for years will see the light of day (many have heard my story about the laundry basket full of pens, which is absolutely true, I had an actual laundry basket in my office full of baggies and baggies of pens). 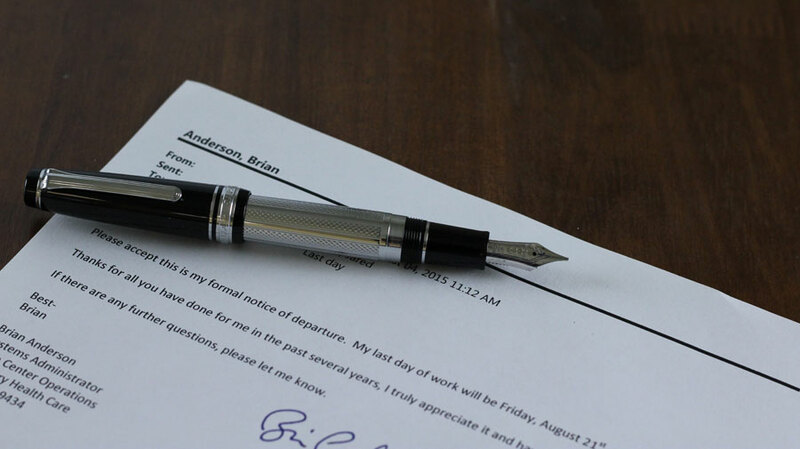 And for those keeping score, what pen and ink did I use to sign my resignation letter? Well, I had two pens in my pocket at the time, a 90th Anniversary Montblanc 149 with Montblanc Irish Green ink, and a Sailor Pro Gear Regency Stripe with Visconti Blue ink. Both would have been fine and significant pens for such an occasion, but I opted for the Broad 21kt nib in the Sailor over the Fine 18kt nib on the Montblanc. A bold statement like this deserved a Broad nib, and the Sailor was just the pen to do it with. Thanks to all who have expressed congratulations on this big event. See you at a show, or even better, at the store!